Across all disciplines, Atlanta Metro – a four-year institution – seeks to cultivate within its students a knowledge-base and repertoire of skills for success upon transfer and in a competitive workplace; a habit of informed, critical thinking; and a strong sense of personal and collective responsibility. Matriculation at Atlanta Metropolitan State College enables students to assume their roles as competent, reflective and socially conscious citizen-thinkers. Founded in 1974, Atlanta Metropolitan State College (AMSC) is a public access institution governed by the Board of Regents of the University System of Georgia (USG). The mission of AMSC is to provide high quality, low-cost access to post-secondary education, primarily to residents in the metro-Atlanta region. An essential component of the College’s mission is to provide a holistic experience for students that integrates academics with a range of co-curricular activities, including experiential learning, life-skills, and civic/community services. A core component of the College’s mission is to provide post-secondary access to a broad demographic of underrepresented, underserved students that will positively transform their economic, social, and civic standing in society. AMSC has a diverse 3,000 student population, with a 3:2 traditional/non-traditional ratio; 40% adult learners; fully commuter campus, with race demographics 92% African-American, 3% Caucasian, 3% Hispanic, and 2% Asian. Although 20% of AMSC students require at least one learning support class, the College consistently maintains a graduation rate higher than the USG State College average, and leads the State College sector with associate degree graduation rates for African-American students. Seventy-four percent (74%) of students receive the Pell grant, and 90% of students receive some form of financial aid. Approximately 30% of students major in Business and Computer Science programs, 20% STEM and Allied Health programs, the remaining have majors in 28% Social Science, and 22% Humanities and Fine Arts. Since 1974, AMSC’s history is replete with thousands of success stories of students who enter AMSC, many in learning support classes, graduate from AMSC and attend the most prestigious professional and graduate schools in the country, and become recognized as authorities in their careers. The College takes great pride that 60% of its student population are first generation college students, and 95% of its graduates are born in Georgia, from metro-Atlanta urban communities. Upon attaining their degrees, most of AMSC graduates return to metro-Atlanta cities and become productive citizens in the State of Georgia. Atlanta Metropolitan State College was elevated to a level two SACS accredited institution in 2012, offering baccalaureate degrees in Business Administration, Digital Media, Applied Mathematics, Biological Science, and Criminal Justice. Other AMSC signature programs include the Moses Ector Law Enforcement Leadership Academy (MELELA), and a baccalaureate degree teacher education program offered on the AMSC campus by Kennesaw State University. The College engages numerous metro-Atlanta and community-based partnerships that “connects the college to the community.” These partnerships are strategically determined and categorized based on services or programmatic relationships, including: (1) Corporate, (2) Secondary Education, (3) Post-Secondary, and Faith-Based/Private. AMSC has a $114M economic impact in the Metro-Atlanta region. Atlanta Metropolitan State College has two overarching Complete College Georgia (CCG) priorities: (1) to achieve, at a minimum, the national graduation rate of 24% for associate’s degree seekers, 65% graduation rate for bachelor’s degree seekers, and (2) to award 600 post-secondary degrees annually, by 2025. The trend in degrees conferred impacted by the CCG efforts of AMSC since 2012 is provided in the following figure. 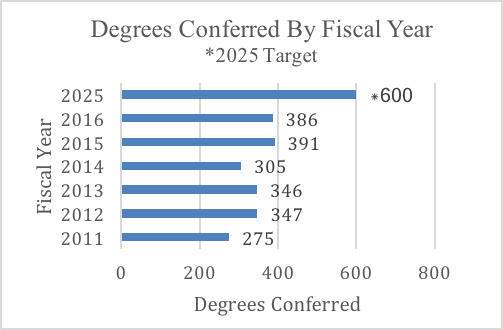 The number degrees conferred (275/year) prior to implementation CCG strategies provides a baseline against which the CCG impact is measured, representing a +40% increase in degrees conferred over a five-year period. Strategy 4.5: Ensure that students who meet off-track criteria receive timely and targeted advising intervention. Students with GPA’s that drop below 2.00 are required to attend an Academic Jeopardy Workshop and meet with a representative in the Center for Academic Advising to develop an Academic Improvement Plan as well as sign an academic jeopardy contract. Students are prescribed appropriate academic and student support services such as tutoring and counseling if indicated. Follow up meetings are mandated. In addition, The Center for Academic Success offers services to directly align with the College’s Academic Alert and First Year Experience programs so that once an Academic Alert signal is triggered, students will receive immediate academic support, providing a wider array of support strategies, including supplementary learning, “real time” workshops that align with student-identified difficult class topics, and an increased academic support staff to include Peer Teachers to assist and expand more services to students. A SAP Registration Hold is placed on academic accounts for students who are not making Satisfactory Academic Progress (SAP) as defined by the Office of Financial Aid (overall GPA being less than 2.0 and/or completing fewer than 67% of their total attempted hours), thus requiring students to meet with a representative in the Center for First Year Experience and Academic Advising to develop an Academic Improvement Plan. Students are prescribed appropriate academic and student support services such as tutoring and counseling. Follow up meetings are mandated. The Center for Academic Advising (CAA) manages and implements integrated and proactive intrusive academic advising strategies with various institutional academic and non-academic activities, targeting academic jeopardy and high-risk retention and graduation student cohorts. In addition, CAA provides advanced academic advising support for high-risk first-time, full-time (FTFT) students. An Academic Alert Student Referral Program is implemented, which allows faculty to seek additional assistance for at-risk students when a threat to their success in a course is identified. Academic Alert is a process that provides students an opportunity to understand “early” if their academic performance is unsatisfactory. For FY2016, The Office of Academic Affairs restructured the Academic Alert Program by mandating that faculty members provide “early” graded assignments within the first four weeks of class. These early assignments help acculturate students to the value of “studying” course materials and attendance, especially with first-year students. It is important to note that not all first-year students understand what is “expected” when matriculating. In fall 2014, attendance issues represented fifty-four percent (54%) of the early alert referrals, followed by forty-five percent (45%) for late and missing assignments. In fall 2015, attendance issues represented 48% percent of the early alert referrals, followed by 52% percent for late and missing assignments. In addition, faculty members were provided with academic alert “recommended” referral due dates to encourage “early” referrals. Academic alert referrals indicate if students have academic performance or attendance issues as well as raise a student’s awareness of his or her progress. Prior to program restructuring, it was common for students to be unaware of or over-estimate their academic performance in classes, usually after the mid-term grading period. After a referral has been submitted to the Center for Academic Advising, students meet with a professional academic advisor, develop an Academic Improvement Plan, and are referred to the Center for Academic Success. The Center for Academic Success provides a wider array of support strategies, including supplementary learning, “real time” workshops that align with student-identified difficult class topics, and an increased academic support staff to included Peer Teachers to assist and expand more services to students. Follow-up reports are provided to the referring course instructor for all academic alert referrals. The leading factors that delay student graduation are: (1) errors or lack of good choices in course selection, (2) changing program of study resulting in loss of credits, thus extending time to graduation, (3) academic jeopardy, which places students on warning, probation or suspension, delaying completion or causing drop-outs, (4) Financial Aid problems linked to Satisfactory Academic Progress (SAP) requirements, and (5) lack of early academic support, resulting in an increase in course attempts, earned/attempt credit hour ratio, and delay in completion. The AMSC Academic Alert Program was expanded and realigned with the Center for Academic Advising to ensure that academic jeopardy and high-risk students are served in an effective manner to promote college completion. First-time Full-time students participated in proactive intrusive academic advising program activities, which included meeting twice during the semester with a faculty and professional academic advisor, ensuring the accuracy of their degree plans, and addressing other barriers that limit this cohort from progressing to graduation. This strategy currently impacts 40% (240 of 600) of new freshman, annually. Most of the impact of this strategy will result from increasing access of adult learners to online courses. Expanding access to online courses increases the options for adult learners to take a wider range of courses as well as increase course load, particularly while managing competing interests (i.e. work and family responsibilities). Collectively, this strategy shortens time to degree completion, and increases rates, which are both very high priorities of AMSC. Progress: Adult Learner “friendly” online classes increased by 50% (4 to 6). Faculty that teach these courses are specially selected and trained to address the needs and/or challenges specific to Adult Learners. As a result, 60% of faculty are trained in Quality Matters (QM). All online courses have a uniform design aligned with QM standards which promotes student success and softens the transition from course to course. In addition to teaching Adult Learner Courses, Instructors are assigned to mentor students; provide technical assistance (i.e. creating PowerPoint presentations, uploading documents into Dropbox, and assistance with using Smarthinking); student support (i.e. improving study habits, referral to Counseling and Disability, and study groups); and academic support (e.g. tutorial). Because of the Adult Learning Consortium (ALC) grant, mentors are paid a stipend to provide these services. Learning communities are also established to foster peer collaboration and support. Prior Learning Assessment (PLA) is also an important component of this strategy for assisting adult learners who may have prior learning that qualify for college credits. AMSC has created a special course to assist adult learners in preparing a portfolio to request PLA credits. Two (2) adult learners completed a portfolio preparation course for FY16, and received prior learning credits (PLA) for 6 credit hours, shortening time to completion, thus reducing tuition/fee costs and time to completion. Serving the Adult Learner population requires tailoring academic endeavors to fit within the demands of life and the real world. AMSC continues to use Adult Learner Satisfaction survey data to improve the on-line learning platform so that it continues to foster healthy interactions among students with peers and instructors. Available resources play a critical role in the success of the student and Adult Learners experience challenges when resources such as tutoring services or research material are not available within an online platform. AMSC’s online platform offers tutorial services and the ability to chat with instructors. These features are as simple as one click. Plans are underway to embed an eLibrarian into the online Adult Friendly course. This eLibrarian will lead modules equipped with videos and manuals that provide insight and support for conducting scholarly research. Students will also have the ability to chat with the eLibrarian, which will provide real-time support specific to the need of the student. The impact for this strategy is approximately 260 students per semester. In addition to shortening time to degree for students, this strategy also increases the number of college-ready students, particularly establishing a pipeline of prepared student to enroll in AMSC baccalaureate programs after high school graduation, thus addressing an essential priority to sustain and grow high producing education programs. Progress: AMSC currently has three Early College partnerships (Maynard Jackson, Booker T. Washington, and Carver Early College High Schools). In spring 2016, AMSC secured an Early College partnership with D.M. Therrell. AMSC is now the only post-secondary institution in Atlanta serving all Atlanta Public Schools (APS) Early College schools. The AMSC MOWR services cover a range of activities, including recruiting, transportation, financial aid/admissions literacy workshops, academic support, and campus orientations and day-to-day monitoring to ensure success of students. In May of 2016, for the first time in the history of Atlanta Public School System, two APS seniors enrolled in the Pre-Engineering Dual Enrollment Program at Maynard Jackson High School graduated from high school with an associate degree in pre-engineering from AMSC. One of these seniors not only earned an associate degree in pre-engineering but also in mathematics. A low student/staff ratio is important for the success of MOWR students; both on and off campus, to provide the range of services and support structure required for MOWR students. The Dual Enrollment Coordinator is currently responsible for monitoring the academic success and individual needs of each of the students participating in the program. Additional academic and social support structures are essential and must be a top priority to support anticipated growth in proportion to the number of MOWR and Early College students. To remedy this strain, an AMSC Assistant Director for Outreach and Access was added in summer of 2016 to support the growing demands of the College’s MOWR program. Appropriate Academic support for MOWR students is essential. Beginning FY2017, in order to ensure higher success and retention rates, MOWR students will be provided additional support by a Student Support Specialist (SSS), which will increase student check-ins, allowing the unit to monitor students that are in danger of failing prior to the midpoint of the semester. The SSS will work closely with the Center for Academic Advisement to monitor students that are on Early Alert as well as implement individualized academic plans for students to be successful. This will also allow more time for the MOWR Coordinator to plan academic and social events (i.e., Resume Building Workshops, Field Trips, Early College Week) for the students. These enrichment programs will not only draw more interested students into the Dual Enrollment program but will also help build a stronger support network for students who are already in the program. In addition, it will also allow the MOWR Coordinator to host Parent Events to discuss students continuing with AMSC to obtain their bachelor degree upon high school graduation. Adding an Assistant Director as well as a Student Support Specialist will allow the MOWR Coordinator more time for maintaining relationships with AMSC current partners, as well as establishing relationships with neighboring school districts. By awarding high school students prior learning credit, such as AP, it builds an early solid foundation of credit hours and reduces time to completion. In addition, dual credits allow for financial resources to be used in other areas of study. This impact strategy will affect approximately 2% of new freshman, but has great potential for growth. AMSC began reaching out to students in the 2014-2015 academic year. During the 2015-2016 academic year, the College adopted a proactive approach for identifying and raising the awareness of AP credit use. Trained Admissions Specialists and Transfer Articulators now look for AP credit and request transcript information for the student. The College has been able to eliminate barriers for students that involve producing paperwork and information for AP credit. For example, the Registrar’s Staff speaks to students individually on how to best assist them in getting the transcript information, as well as taking the AP credit off another USG school’s transcript. These initiatives save time and cost to student, ultimately reducing time to completion. AMSC awarded 263 hours of credit in last 2 ½ years since the College began tracking with the new codes for advance standing in spring 2014. Most of AMSC’s incoming freshman either do not pass the AP test or cannot afford to pay to take the test at the end of year. The College is promoting providing students the option of MOWR, in addition to AP credit, because of the cost factor to the student. AMSC will also accept student AP credit from another USG institution in order to avoid student out-of-pocket expenses. This began as an agreement with the Adult Learner Consortium and has been very beneficial to students. Twenty percent, 600 students annually, are enrolled in a learning support (LS) class, thus any improvement to reduce the number of LS students or reduce their time in learning support is an institutional priority, and will result in a significantly positive impact on these student’s retention and completion. Early integration of LS students into gateway courses builds their self-esteem, agency, self-determination, and translates into higher retention rates, better grades, and ultimately higher graduation rates. Previous: Two pilot Gateway/Learning Support Math Courses were offered, with a total of 25 students, during FY15, to test the feasibility, fine tune implementation logistics, and determine outcome performance metrics. The results did not show a statistical difference between the performance of students who participated in the pilot course versus those who followed the traditional pathway of taking the learning support course as prerequisite prior to the taking the gateway course. The course success rates were in the range of 55-60%. While there was no net gain in the pass rate for students taking the pilot courses, neither were the results worse than the control group of students, which suggests promise if the proper adjustments are made for improvement. Progress: During FY16, the number of co-requisite gateway courses were increased significantly, from 2 to 12 courses, moving approximately 40% of learning support students from foundation learning support courses to gateway co-requisite courses. The performance of the LS students moved to the co-requisite gateway courses shows cautious optimism, as these students demonstrated an increase (56% vs. 52%) in their Mathematics class pass rates when compared to students who follow the traditional pathway of completing the Foundation LS class prior to taking the gateway course. The same comparisons for the English Gateway co-requisites classes were slightly less 54% to 52%, but did show slight improvements, within the margin of error. Class performance is stronger when the same instructor teaches both the gateway and learning support co-requisite courses. Many unexpected factors come into play when integrating LS students into gateway courses, such as the social dynamics and interactions between LS and Non-LS students in the class; Being careful to not stigmatize students who require an additional one hour co-requisite class is important; The difficulty in the process for mainstreaming LS students into rigorous gateway courses should not be underestimated and should be comprehensively planned and implemented. Observation and Projection #1 - Because of the enormous benefit of the Move on When Ready program to students, AMSC will continue to expand its MOWR program. It is projected that the College’s MOWR program will increase growth by at least 30% for FY17. The College will expand options, emphasize and provide extended support for MOWR students who pursue post-secondary credentials while in high school. Observation and Projection #2 - AMSC will fully implement predictive analytics into its CCG recruitment and retention strategies. In FY17, the integration of these analytics tools, along with data Dashboards, will be institutionalized and enable all critical campus stakeholders to better use data for decision-making and problem-solving. Observation and Projection #3 - The most significant addition to CCG strategies for FY17 will be targeting CCG strategies to low-income students, based on the Lumina Foundation’s model. The strategy will have enormous impact. A recent USG conference was very instrumental and timely in allowing USG institutions to reflect on and plan for CCG improvements. This conference involved System institutions exchanging ideas and sharing best practices for how post-secondary institutions might better support low-income students toward completion. AMSC has identified four modified/new strategies that will continue to build on its progress made over the past four years through CCG initiatives, specifically targeting low-income students. These strategies are listed below, and will be implemented on the schedule indicated. GOAL: Measure progress of low income students on Strategy 1 metrics over time. WHAT: Track progress metrics of low income students over time. HOW: Optimize available data sources (e.g. USG Data Warehouse, IPEDS, Banner, etc.) to determine progress metrics of low income students over time. WHO: Office of Institutional Effectiveness will lead campus-wide initiative beginning 2017. BARRIERS: Inability to reach students who drop-out. GOAL: Develop a comprehensive financial literacy program for low-income students. GOAL: Review internal policy & practices annually to ensure compliance (e.g. forms, documents, job descriptions, evaluations, etc.). HOW: Every division, department, office, center, will review policies & procedures with its purview in conjunction with Office of Institutional Effectiveness. WHO: Senior Leadership in conjunction with Office of Institutional Effectiveness. GOAL: To centralize and institutionalize an Office of Career Placement Services to provide students assistance with career exploration, job placement, and graduate admissions, including internships and externships. WHAT: To establish an Office of Career Placement Services to facilitate assistance with career exploration, job placement, and graduate admissions, including internships and externships.